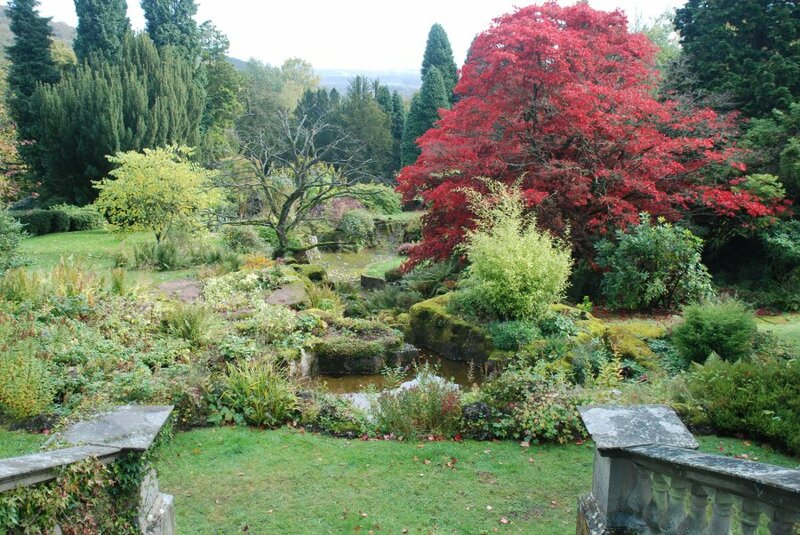 Abberley Hall was first brought to my attention in 2011 by one of the Trustees of the Abberley Hall Foundation, who told me that they had a fine example of a Pulham garden, and were putting together an application for a restoration grant from the Country House Foundation. . . but the source of this was the English Heritage database, which records the dates as 1867-80s. As it was not recorded in the booklet published by James 2 c1877, however, I would suggest that the 1880s are a more reliable suggestion. 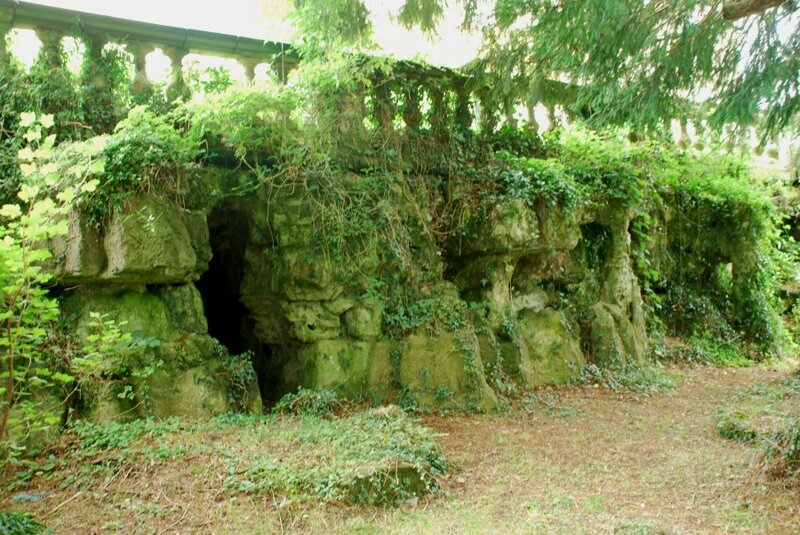 The archive research involved local NADFAS – National Association of Decorative and Fine Arts Societies – volunteers, and it was as a result of this work that NADFAS decided to add ‘Pulham Rock Gardens’ to their portfolio of research categories. Fig 6 shows the Lower Pool in the Water Garden during and after restoration, and Fig 7 shows the Water Garden, viewed from the balustraded Terrace. Fig 8 shows the Pulhamite ‘cliffs’ facing the wall supporting the terrace, where the mouth of a grotto can be seen in the centre of the wall. 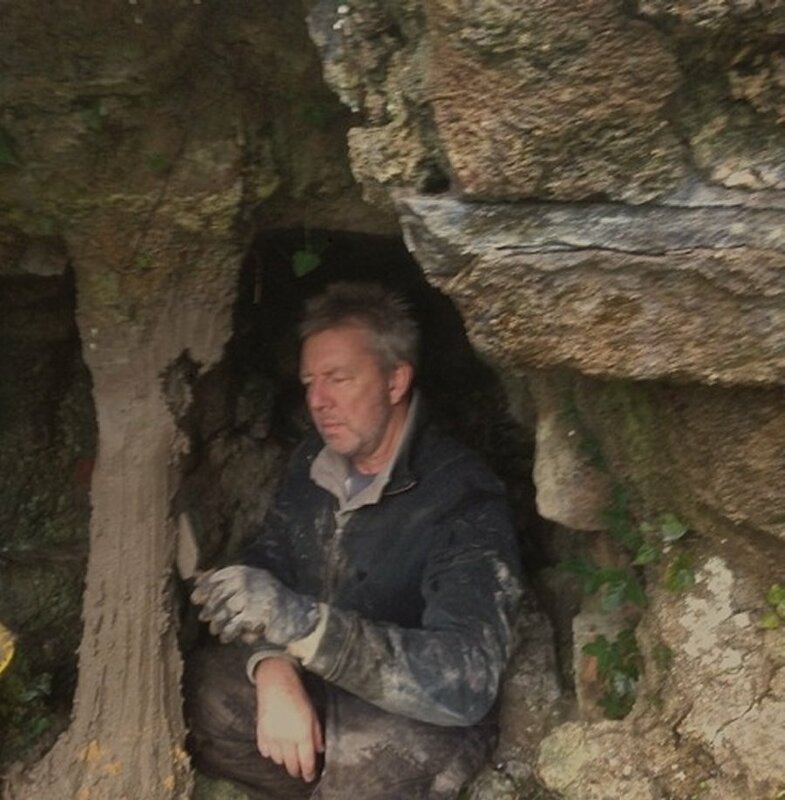 The interior of this tufa-lined grotto – where Alan Bishop is seen at work in Fig 9 – is thought to have possibly pre-dated the Pulhams’ work, although this cannot be confirmed. Further restorations to the terrace etc are still in progress. James Pulham and Son’s work in the Preston Parks was discussed in my ‘Site of the Month’ feature for December 2013. Thanks to a grant of nearly half of the £5 mil from the Heritage Lottery Fund in 2008, Moor Park, Avenham Park and Miller Park have been the subject of major restoration works over the past few years, and are now nearing completion. Water had not been flowing over the Pulhamite Cascade in Miller Park for some years, but is now back in working order, thanks again to the work of Alan Bishop. Special coloured lighting has been arranged beneath the cascade to show it at its best after dark, but these are not yet quite ready, and the surrounding planting has also to be completed, so I hope to have some pictures in my next News Letter. The Pulhams’ work at the Swiss Garden at Old Warden, in Bedfordshire, is discussed in Chapter 10 of Rock Landscapes: The Pulham Legacy, so there is no need for further descriptions here, except to say that a major £2.8 mil restoration project has just been completed, and these charming and unique gardens are once more open to the public. A lot of the main features were actually created prior to 1876, when Joseph Shuttleworth engaged James Pulham and Son to work on the central Fernery, and to add some Pulhamite adornments along some of the banks to the lakes, and pathways around the gardens. Some of these features suffered from the ravages of time, and were included in the restoration programme. Alan Bishop and Associates were also responsible for some earlier restoration work here during the 1990s, but the contractors for the project that has just been completed were Simon Swann Associates. The firm of Alan Bishop & Associates has been mentioned in connection with four of the above six projects, and he was also involved with work at the five sites listed below. The references ‘RL’ relate to the Chapter in Rock Landscapes: The Pulham Legacy in which the site is discussed, and ‘SM’ refers to the date at which they featured as ‘Site of the Month’. It is really a great pleasure to be able to report the evidence of such a wide appreciation of our Pulham Heritage, and long may these restoration and preservation projects continue. It occurred to me recently that there might still be a few people out there who have not yet read my book, and part of the reason for this could be that there were not many specific references to the principal people and places featured in the book within the Google Search Engines. Alternatively, you can click on the short-cut ‘Contents’ Button on the Home Page, and that will also take you straight there. This means that The Pulham Legacy Website now contains more than 125 pages of articles, site reviews and information – and rising! Readers of these News Letters will know that I always close by reminding them that copies of my book are available at the very Special Discounted Price of £25 via my website – i.e. £21 plus £4 p & p. That is equivalent to a net saving of nearly 30% on the R.R.P. of £35! Enter the code ‘PL1’ in the ‘Promotion Code’ box at the top of that page, and click on the ‘Apply’ button. This updates your invoice with the 25% ‘Promotion Discount’, bringing the net price of the book down to £26.25. Click on the ‘Proceed to Checkout’ button. Click on Create Account. This will entitle you to a further ‘Customer Loyalty Discount’ of 20%, bringing the Net Price of the book down from £26.25 to £21. Proceed to Checkout. £4 P&P will be added for UK customers. Overseas rates will vary. Happy Reading! I send you our Season’s Greetings, and we look forward to seeing you soon. Posted on November 9, 2014 November 10, 2014 by Claude HitchingPosted in NewsTagged . . James Pulham and Son, Abberlet Hall - Worcestershire, Alan Bishop, Claude Hitching, Preston Parks - Lancashire, Pulham Legacy News Letter, Pulhamite Restorations, Rock Landscapes: The Pulham Legacy, Simon Swann Associates, Swiss Garden - Old Warden.